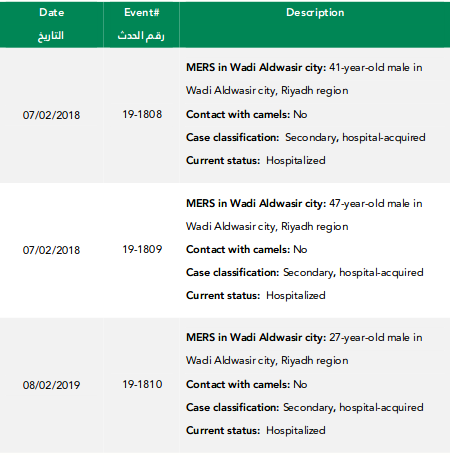 The MERS surge in Saudi Arabia continues today with 7 more cases - bringing the KSA total since the first of the year to 50 - with 36 of those reported over the past 11 days. All 7 of today's cases hail from the recently hard hit town of Wadi Aldwasir, bringing their total to 30 cases in the past two weeks. Three of today's cases are listed as secondary, hospital-acquired, while one is listed as secondary, household-contact. Three others are listed as primary, community-acquired (1 with camel contact). 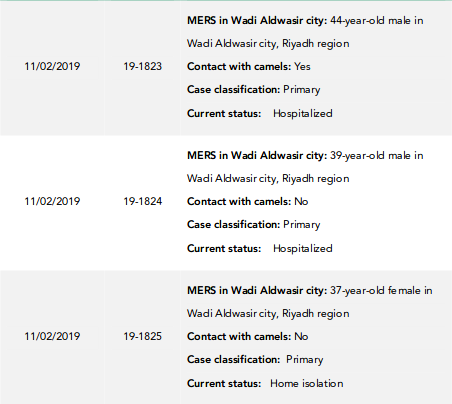 In addition to five patients that are described as primary (3 with recent camel contact) - the MOH has reported 3 different clusters of cases in Wadi Aldwasir. 17 cases have been listed as secondary, healthcare-acquired. Today's update also reports on the death of one of yesterday's cases - a 54 y.o. male (primary, no camel contact) from Riyadh. 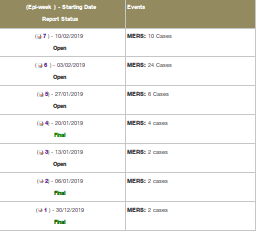 For a partial update on the Omani Cluster of 5 (2 deaths), see my earlier blog from this morning WHO EMRO MERS-CoV Summary - January, 2019.